An estimated one million people are affected by food poisoning in the UK every year. Consuming food contaminated with bacteria such as Campylobacter, Salmonella, E.coli and Listeria, can give you a very unpleasant bout of sickness and diarrhoea. In the worse cases, especially in the very young, the elderly and people with a weakened immune system, this can be fatal. Many of these bacteria are present in the environment and even in our own intestines, where they usually do no harm. However, certain strains of bacteria, which may be present in foods such as meat, vegetables and dairy products, increase in damp and warm conditions, producing toxins that can make you very ill indeed. Always wash your hands thoroughly with hot water and soap before and after handling food. Wash them again if you’ve put things in the rubbish bin, which is a prime place for harbouring germs, and which should also be emptied and disinfected regularly. Use different chopping boards (maybe colour-coded) for raw and cooked meat, vegetables, bread etc. and scrub and disinfect these after use. Use disposable cleaning cloths or hot-wash dishcloths and tea towels after use; don’t leave damp cloths by the sink or re-use tea towels – they are an ideal breeding ground for germs. 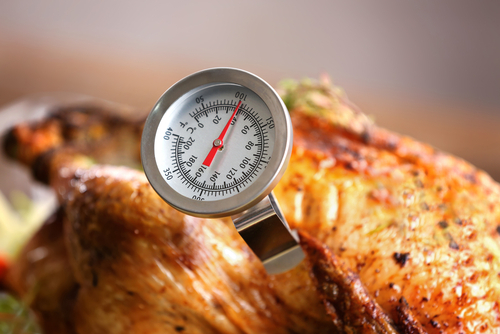 Make sure meat, especially poultry, is thoroughly cooked before eating – use a meat thermometer if in doubt. Store raw meat in a sealed, clean container at the bottom of the fridge, so it can’t drip onto or touch other food. Store cooked meat, cheese and other foods, well wrapped up or covered, on a higher shelf in the fridge. Don’t leave food out on the worktop in a warm kitchen for longer than necessary. Make sure you cool and refrigerate or freeze cooked food quickly if you intend to store it and don't re-freeze previously thawed frozen foods. Eat things before the “sell by” or “use by “ date, unless you’re absolutely sure they are safe. If you re-heat cooked food, especially rice, don’t store it in the fridge for more than a day or two and make sure it is absolutely piping hot all the way through before you eat it. Thoroughly wash salad leaves and vegetables in clean running water. Discard the outside leaves, which are most likely to have come into contact with soil-borne bacteria, or cook them in a soup. Wash unpeeled fruit before eating. Especially if you have a weakened immune system or if you’re pregnant, avoid unpasteurised milk, products containing raw eggs and soft cheeses such as Brie, Camembert or mould-ripened goat’s cheese. As well as taking regular exercise, cooking fresh food from scratch and including lots of colourful fruits and vegetables in your diet is the best way to stay healthy. If you follow the above advice, you should avoid the unpleasant effects of a “tummy bug” and the food you consume actually making you ill.